Step 1 In a large baking dish (14-by-10 like this one, for example), do a quick test to see how many challah bread slices can fit in one layer without overlapping. Step 2 Now, using 1 tbsp soft butter, butter the bread on one side, and arrange in the prepared baking dish, buttered-side down. Step 3 Tear more bread, enough to fill any open spaces. Butter the torn pieces with the remaining soft butter, and fit them into open corners and cervices. Step 4 Make the custard. In a large bowl, whisk together the yogurt, eggs, honey, and vanilla. Pour over the challah; coat evenly using a spatula, and pull a few slices up to let the custard underneath. Step 5 Cover and refrigerate overnight. Step 6 In the morning, preheat the oven to 350 degrees F, and place an oven rack in the upper third. Step 7 Dot the challah all over with the cold butter, then pour 1/4 cup milk all over. Step 8 Bake, uncovered, for about 30 minutes, or until the custard is set and the challah is almost firm to the touch. Flip on the broiler and broil for 2 minutes, watching carefully, until the top is golden brown. Step 9 While challah french toast is baking, make the honey simple syrup. In a small saucepan, combine honey and water. Bring to a boil over medium-high heat, stirring occasionally. Lower heat to simmer for about 20 minutes. Remove from heat and let cool to lukewarm. Stir in the lime juice. 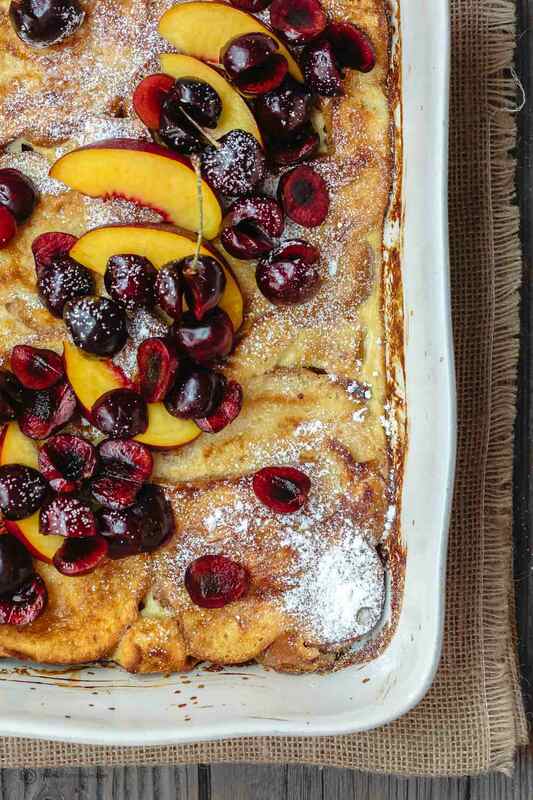 Step 10 To serve the baked challah bread french toast, sprinkle confictioners’ sugar and top with your favorite fruit (we used pitted cherries and nectarines). Serve honey simple syrup next to it allowing everyone to help themselves to as much or as little syrup as they like. Enjoy! Stupid easy, and healthier, overnight baked French toast with challah bread, fresh fruit, and a side of honey simple syrup! Prep it at night and come morning, slide it into the oven while you enjoy your coffee!